British Columbia’s climate is changing; and change is occurring at a rate much faster than anticipated. Looking back, 2015 marks the beginning of a ‘new normal’ which is defined by recurring extremes. Floods, drought, forest fires and windstorms – all are happening within the same year, and year after year. 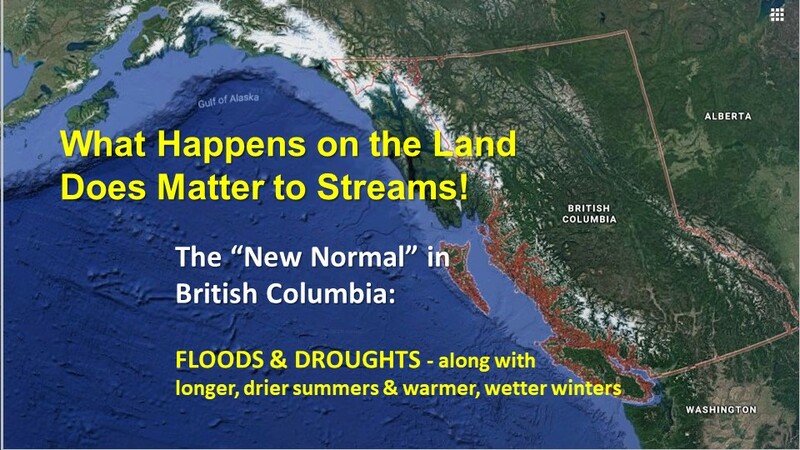 In 2019, British Columbians are now in Year 5 of this new reality: warmer, wetter winters; longer, drier summers. Droughts, dwindling snow packs, melting glaciers, beleaguered salmon runs and costly forest fire seasons are followed by windstorms and heavy rains. Clearly, we have crossed an invisible threshold into a different hydro-meteorological regime. Last week, a new scientific report from Environment and Climate Change Canada said Canada is warming up twice as fast as the rest of the world and it’s “effectively irreversible”. 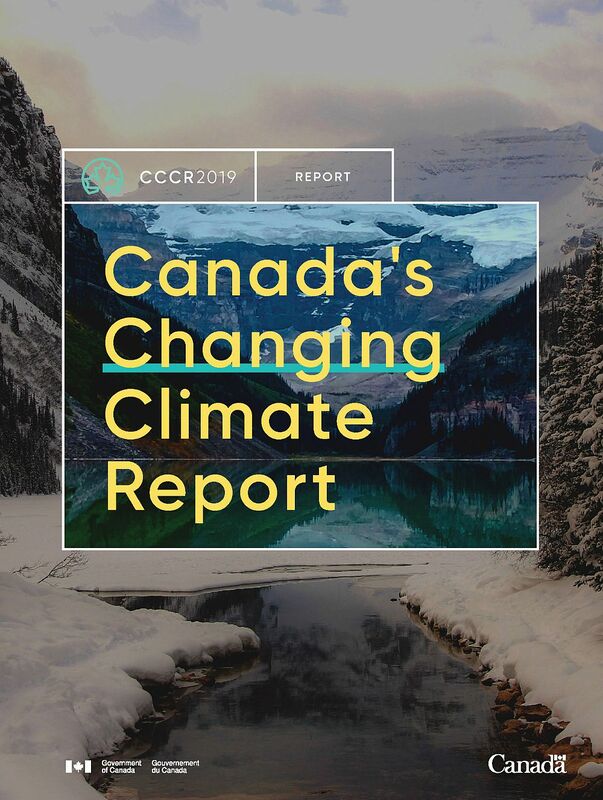 The first in a series, this report is about how and why Canada’s climate has changed and what changes are projected for the future. It documents changes across Canada in temperature, precipitation, snow, ice, permafrost and freshwater availability as well as in Canada’s three oceans. 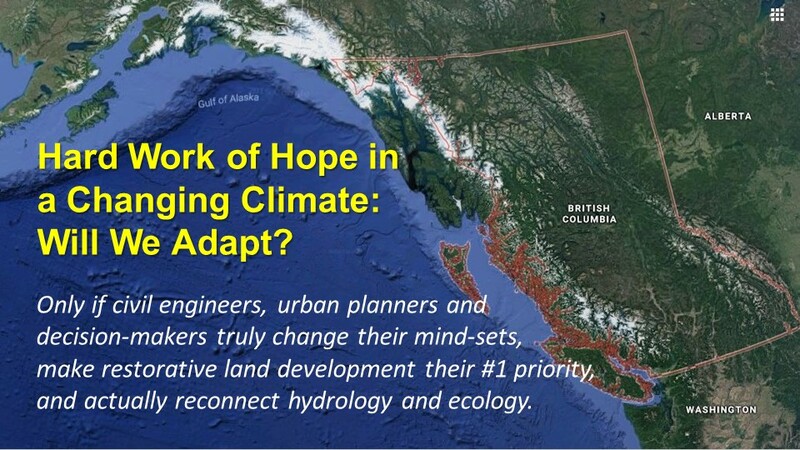 This report, with its dramatic findings, also provided timely and relevant context for the Second Vancouver Island Symposium on Water Stewardship in a Changing Climate, held in Parksville; and co-hosted by the Partnership for Water Sustainability, Nanaimo & Area Land Trust (NALT), and the Mid Vancouver Island Habitat Enhancement Society (MVIHES). Hard Work of Hope in a Changing Climate: Will We Adapt? 2018 was a teachable year. Last summer, if you wanted to know what climate change will mean to your future, all you had to do was be outside to see what is to come. The entire Northern Hemisphere was impacted by extreme weather – drought, forest fires or flooding. Week after week, we in British Columbia were unable to leave the smoky room of a rapidly changing climate. B.C. is one of the last places on the planet where it is still possible to transcend the climate debate and create a better world. B.C. has enough remaining natural capital to protect and restore its way back to true sustainability. We are at a moment of truth. Will we adapt? Time is of the essence. The rate and manner in which water moves through the global hydrological (water) cycle is accelerating. This is causing hydrologic instability, and that is why recently identified phenomena such as atmospheric rivers demand our attention. An atmospheric river is a narrow corridor of concentrated water vapour aloft. These great rivers can be 400 kilometers across and thousands of kilometers long. 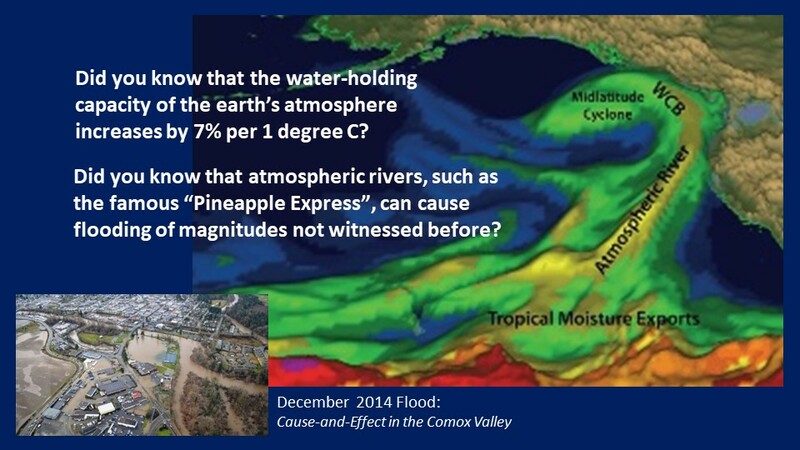 The best known is the famous “Pineapple Express” which periodically crosses the Pacific from Hawaii and unloads heavy rain when it hits the west coast of North America. When moderate in scale, atmospheric rivers bring badly needed water to dry states like California. When larger in scale, they can cause flooding of magnitudes not witnessed before. The laws of physics provide a reality-check: the warmer the global temperature becomes, the more water the atmosphere can carry. 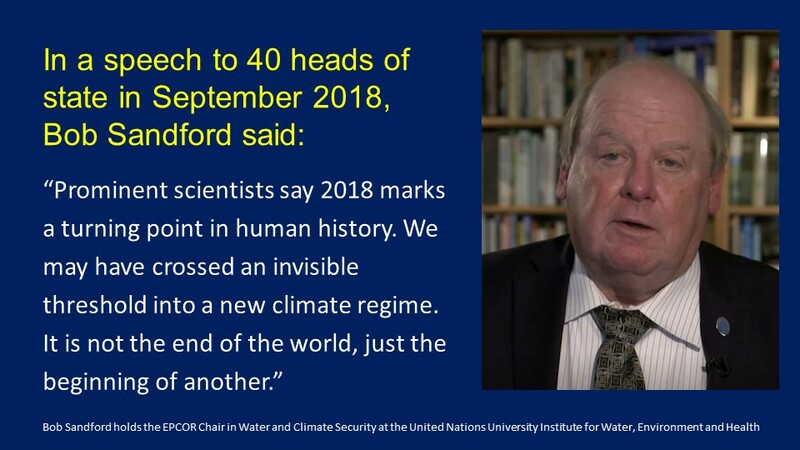 The risk is that, until we stabilize the composition of the Earth’s atmosphere, phenomena such as atmospheric rivers are likely to cause greater flooding and related economic damage widely – forever making sustainability and adaptive resilience a moving target. So what will we do? Local governments are implementers. This means they can be change leaders. They can integrate climate adaptation into the activities and actions of engineered and natural asset management – or flipping it around, integrate asset management into the activities and actions of climate adaptation. 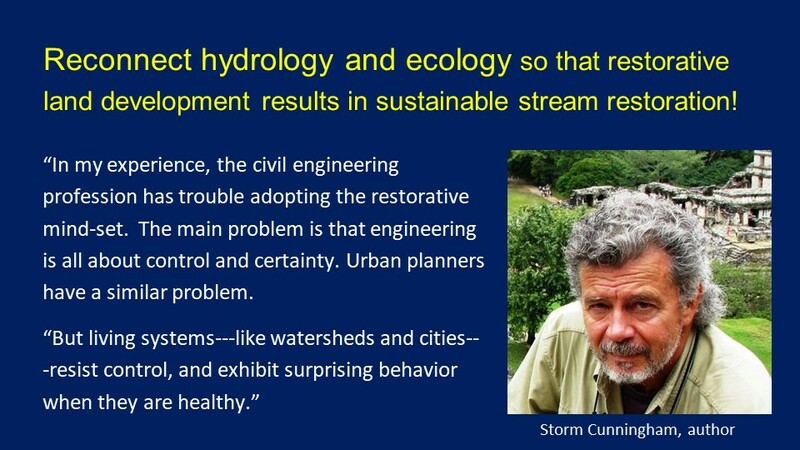 Getting it right starts with recognition that hydrology is the engine that powers ecological services.